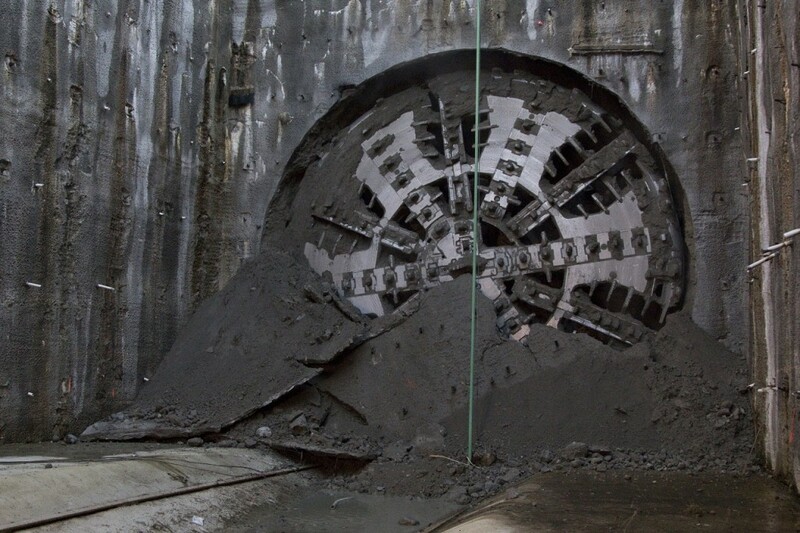 The TBM drilled a single two-kilometre tunnel starting east of Barnet Highway in Port Moody to south of Kemsley Avenue in Coquitlam. The tunnel will link Burnaby, Port Moody and Coquitlam to the existing SkyTrain line serving Metro Vancouver. Boring the tunnel was the most complex and technically challenging part of the Evergreen Line project. "Celebrating the completion of the tunnel boring work today is a great milestone for the project and for the communities this line will serve," 􀀃said B.C. Transportation Minister Todd Stone. "The Evergreen Line project is more than 75% complete, and the work to finish the line, including the tunnel, is well underway. Once Evergreen is complete, B.C. will have the longest, fully automated rapid transit network in the world." Previous delays have pushed back the opening until 2017. The elevated and at-grade guideway in Burquitlam, Port Moody and Coquitlam is complete. The station buildings range between 80% and 99% complete. There are seven stations along the project alignment: Lougheed Town Centre Station, Burquitlam Station, Moody Centre Station, Inlet Centre Station, Coquitlam Central Station, Lincoln Station, and Lafarge Lake- Douglas Station. EGRT Construction is responsible for building the elevated and at-grade guideways, the two-kilometre bored tunnel, seven stations, power substations, train-operating systems and roadworks, as well as a vehicle-storage and light-maintenance facility. The consortium led by SNC-Lavalin was awarded an $889 contract in 2012 to design, build and finance the Evergreen Line Rapid Transit Project. The $1.43 billion project a partnership between the federal and B.C. governments and TransLink, the regional transportation authority.